Lying in the shadow of the Place du Trocadéro and the Eiffel Tower, Les Jardins du Trocadéro hotel is located in a prestigious neighbourhood not far from some of the city's most famous museums and within easy walking distance of the Champs Elysées. The hotel is surrounded by a curtain of trees, creating a peaceful and charming atmosphere. The architecture and décor, which includes a wonderful, sculpted metal door, are quite simply sumptuous. The bar and reception rooms boast stone walls, warm, stylishly covered furniture and elegant drapes. The corridors are decorated with guiding muses painted by art-school students which lead the way to the rooms. 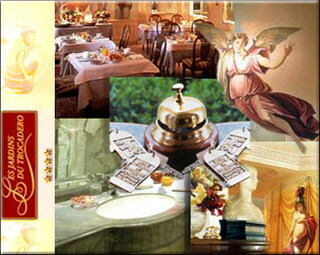 With its welcoming and impeccable service, this hotel makes an idyllic place to stay in the city.